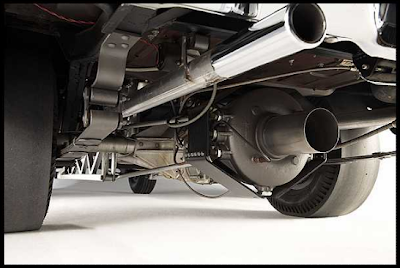 The most outlandish of these devices was the Rocket Drag Axle, which connected mechanically to a car’s differential and, when ignited, surpassed the engine’s motive force by upwards of a thousand horsepower and launched the vehicle forward at a truly mind-numbing rate of acceleration. The infamous Black Widow Volkswagen Beetle, a basically stock Bug fitted with a Turbonique Rocket Drag Axle, instantly became a drag racing legend by leaving Tommy Ivo’s four-engine Showboat dragster in its dust with a 9.36 elapsed time at 168 mph on Sept.19, 1966, at Tampa Dragway. 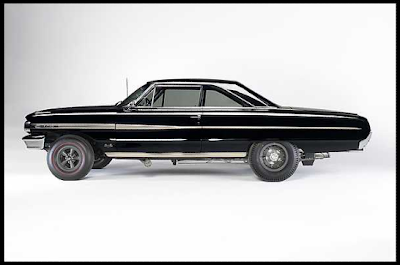 This sinister Ford Galaxie is not a metaphorical rocket, as in "fast as a rocket!" 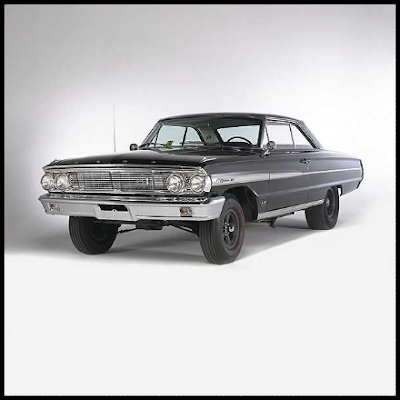 It is not a marketing trademark like Oldsmobile's Rocket 88. 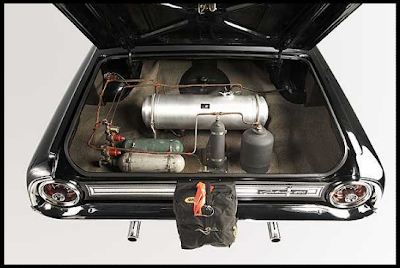 This car actually is rocket-powered. 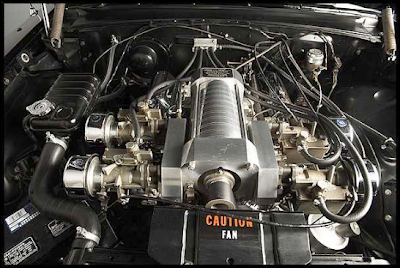 In addition to the prodigious amount of power created by the supercharged 427 engine topped with four side draft carburetors, there is a genuine rocket engine affixed to the differential that generates an extra 1000 horsepower. There are some stories that can't be told in words but can only be truly understood through an object of the era. The stories of cruising Bellflower Boulevard, the Bonneville speed trials, the advent of Whittier Boulevard lowriders, the WWII aerospace effort and moonshine running in '40 Fords are brought from the history books to brilliant Technicolor reality when you are able to experience an artifact in real life. There is the sculptural quality of seeing the object in space that makes it real and palpable but, even more importantly, there is the human element of coming to grips with the craftsmanship and engineering of details. That is where you see the mark of the individual. 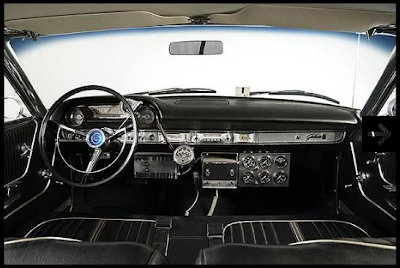 This car epitomizes what I wanted to be when I grew up... A savage engineer on the razor's edge. A craftsman dedicated to awesomeness. An artist building folly. It is easy to dismiss this illegal monster as a rich kid's plaything, but that does not begin to tell the story. 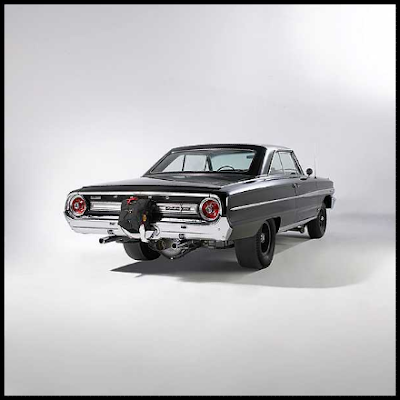 The rocket-powered Galaxie is a beautifully executed assembly of the best technology of the time. Mad scientist-style Turbonique for the Rocket Drag Axle, commercially available speed equipment from Carter and Lathem, war surplus from Uncle Sam and ham radio equipment from hobbyist suppliers. This is not a Corvette purchased off the lot but, rather, a finely curated assemblage of great creativity. Far more than an exercise in the history of 1960's speed equipment and cinder block workshop engineering, this is a story about the end of the outlaws. As when Hunter Thompson went to Vegas and Tom Wolfe rode with the Pranksters, these were the final days of those who lived in the wonderland just outside the laws. The world was changing so fast that the disparate elements of the freak power contingent were hitting the straights and ninnies from all sides. Those poor district attorneys in Vegas just didn't know what was happening to the world. As the world became a more litigious and uninteresting place, these brazen animals gave way to the sober Ralph Nader regimented era of corporate responsibility. As we jumped our Schwinn Stingrays over trash cans, these extravagant and vulgar machines were an inspiration to be our best. It is no wonder Jackass, monster trucks, Jesse James and hardware hacking are so popular, as these are the remnants of doing the wrong things for the right reasons. Extraordinary personal expression as high art and savage good times.